On any list of the top things to see in Hawaii you'll find Hawaii Volcanoes National Park. Rent a Hawaii timeshare on the Big Island, and plan a day visiting one of the most fascinating National Parks in the U.S., and definitely the most unique. Hawaii Volcanoes National Park was established on the Big Island of Hawaii in 1916. Over 500 square miles, this Park displays the results of the hundreds of thousands of years of volcanic activity that helped create and shape the beautiful islands of Hawaii that we know today. Home to such diverse bio systems as the dense Ola'a rain forest, and barren Ka'u Desert, the Park also contains the world's most active volcano, Kilauea, and most massive volcano, Moana Loa. In recognition of its incredible and distinct natural values, Hawaii Volcanoes National Park was designated as an International Bioshpere Reserve in 1980 and a World Heritage Site in 1987. Views of the volcanic landscape are dramatic, and bring home the very real sense of nature's awesome power. You'll be able to see everything from steaming caldrons to slow-moving lava flows (that you can actually walk right up to). Active eruptive sites include the main caldera of Kilauea, and an even more active but remote vent called Pu'u O'o (see photo). Each minute, 130,000 gallons of molten rock spew from this Kilauea vent, enough to entirely cover Washington DC once every five days. The Park offers great hiking opportunities, including trails to the ocean's edge where you'll be able to see the dramatic boiling and churning of water as hot molten lava and cold sea water meet. Since 1983 over 500 acres of new land have been added to the Park as this volcanic "island building" continues. 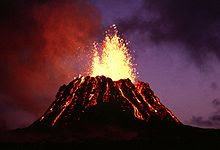 From ancient times Hawaiians have considered Kilauea as the sacred home of their fire goddess Pele. The first western visitors to the site, missionaries William Ellis and Asa Thurston, saw Kīlauea in 1823. "A spectacle, sublime and even appalling, presented itself before us. We stopped and trembled. Astonishment and awe for some moments rendered us mute, and, like statues, we stood fixed to the spot, with our eyes riveted on the abyss below." A timeshare rental vacation where you can get up close and personal with volcanoes is an opportunity certainly not to be missed!